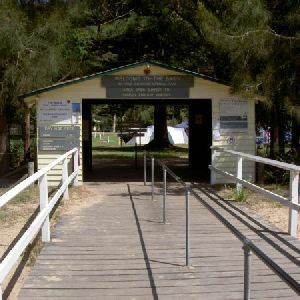 From Resolute Picnic Area car park, the walk heads through the picnic area, away from the road, to follow the ‘Red Hands Track 50m’ sign. The walk then descends a flight of stairs to the intersection at the bottom. Continue straight: From the intersection, the walk heads down the hill, following the rocky outcrop to the right of the track. 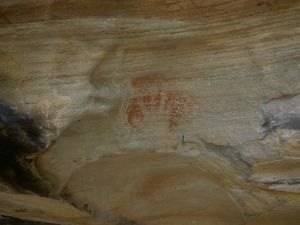 The walk follows this for approximately 30m to the interpretation signs for Red Hands Cave. At the end of this side trip, retrace your steps back to the main walk then Turn right. 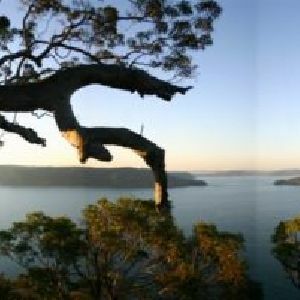 Turn left: From the intersection, this walk follows steps down the hill following the sign to ‘West Head Lookout’. The track continues to undulate along the hillside passing a sign pointing to ‘West Head Lookout’. 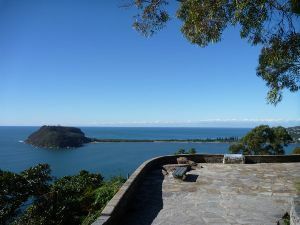 The track continues along the hillside to open out onto the sandstone paved area of West Head Lookout at a signposted intersection. 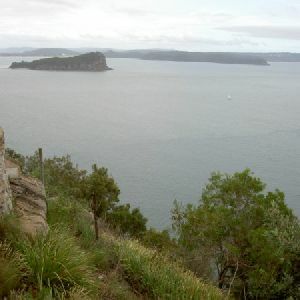 Turn right: From West Head Lookout, this walk leads down the hill for 100m, following the ‘West Head/ Resolute Beach’ sign down into the bush. 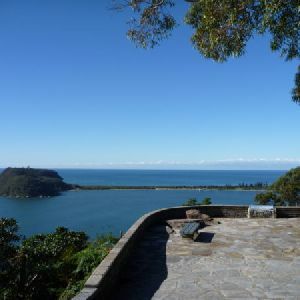 The track then passes an informal, unfenced lookout on the left, to then continue down the hill for approximately 300m. This walk then descends two sets of stairs, passing a prominent overhang on the right and a small creek waterfall on the left. From the stairs, the walk continues to the sign marked intersection for West Head Beach. Veer left: From the intersection, this walk heads down the staircases to the beach, approximately 100m below. At the end of this side trip, retrace your steps back to the main walk then Turn left. 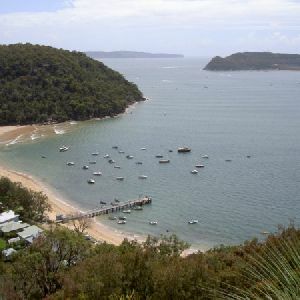 West Head Beach, Ku-ring-gai Chase National Park, is a small stretch of sand sitting on the West Head Peninsula. 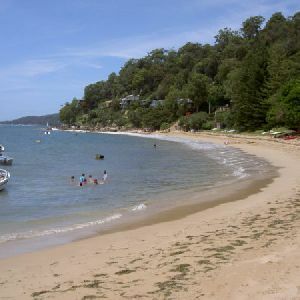 The beach has an easterly aspect, facing out of steep hills over Pittwater to the Barrenjoey Headland. 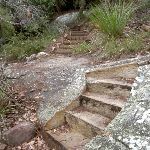 Veer right: From the top of the steps, this walk heads south (leaving the steps behind on the left), passing below the prominent rock faces for 200m as the track undulates around the contour of the hill. The track slowly turns right, following the curve of the spur, to pass a gun emplacement on the left. The track then continues heading down the cliffline (above the track on the right). The track then passes through a creek from which it leads to an unsignposted intersection with a downhill track on the left. 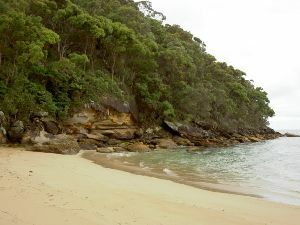 Turn left: From the intersection, this walk heads down the hill towards the water, following the creek line to the beach. 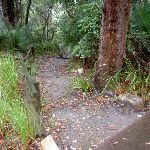 The track winds down the hill for approximately 30m to a small creek waterfall. 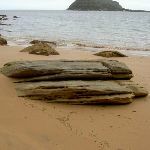 The track is hidden in parts by grasses for approximately 20m before it heads down a few flights of stairs to where the track reaches the beach. At the end of this side trip, retrace your steps back to the main walk then Turn left. 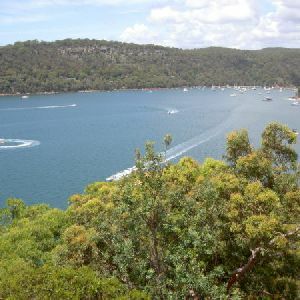 Resolute Beach, Ku-ring-gai Chase National Park, is a small stretch of sand sitting on the West Head Peninsula between steep headlands. 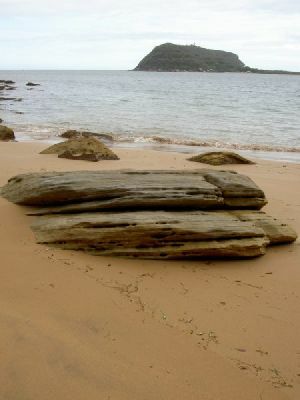 The easterly aspect of the beach overlooks Barrenjoey Headland across the Pittwater. 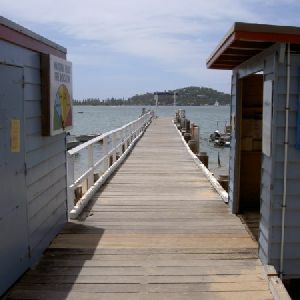 Veer right: From the intersection, this walk heads along the hillside, keeping the beach and water below to the left, before coming to the signposted intersection. 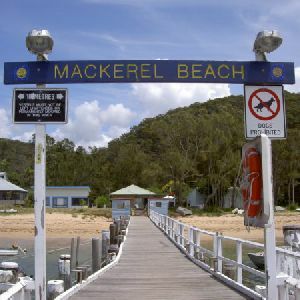 Continue straight: From the intersection, this walk follows the signpost to ‘Mackerel’ heading along the hillside beneath a rocky outcrop on the headland. 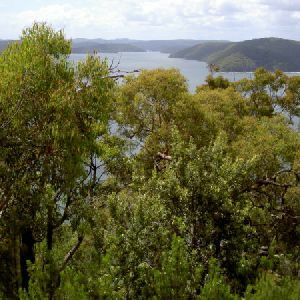 The track then meanders along the hillside, undulating slightly for approximately 400m to pass a ‘Ku-ring-gai Chase National Park’ sign. From the sign, the walk then heads down to two palm trees and a boulder painted with a black arrow on the beach. At the end of this side trip, retrace your steps back to the main walk then Turn left. Turn right: From the intersection, this walk heads up a staircase for approximately 30m. The track then turns after the set of stairs. The track leads up the hill to the signposted intersection, with the cave to the right of the track in the cliffs. Veer right: From the intersection, this walk heads towards the rock formations, following the hillside. 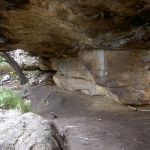 The track then enters an overhang of a cave. At the end of this side trip, retrace your steps back to the main walk then Veer right. Turn left: From the cave intersection, this walk heads up the steps, keeping the sea below on the left. 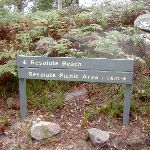 The walk passes below a small cliffline before leading up more steps to an intersection and a sign pointing back to ‘Resolute Beach’. Veer right: From the intersection, this walk heads up the hill following the sign to ‘Resolute Picnic Area 1.5km’. The walk then winds up the management trail, passing up a steep slope in one area. The track then continues up to an unsignposted intersection on the right, in the heath. 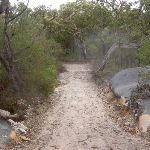 Veer right: From the management trail, this walk heads away from the management trail and views of the water, to wind through the dense scrub for a short time. 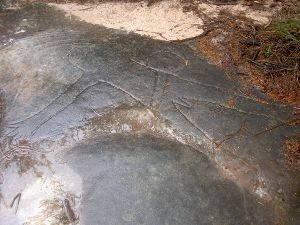 The track rises onto a rock shelf, clear of vegetation at the engravings. 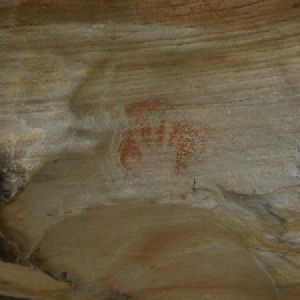 The engravings on West Head were made by the indigenous Guringai people. 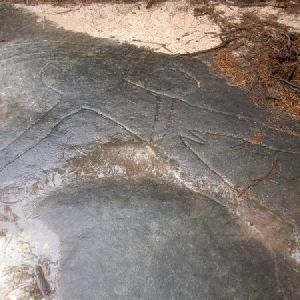 The engravings depict a man, shark/whale and two eels. Turn right: From the engravings, this walk follows the service trail up a hill, away from the information sign. The walk continues up the hill to the intersection with a signpost for Red Hands Cave. Continue straight: From the intersection, this walk heads up the sandy service trail, leaving the ‘Red Hands Cave 0.85km’ sign and track behind on the right. The track continues for approximately 100m to the picnic area. 2.4km of this walk has short steep hills and another 630m is very steep. Whilst another 360m is flat with no steps and the remaining 120m has gentle hills with occasional steps. 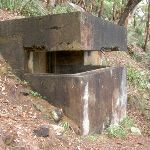 1.9km of this walk follows a clear and well formed track or trail and another 1.1km follows a formed track, with some branches and other obstacles. The remaining (540m) follows a rough track, where fallen trees and other obstacles are likely. 2.2km of this walk is clearly signposted and another 820m has minimal directional signs. The remaining (510m) has directional signs at most intersection. 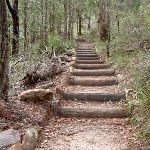 Around 2.5km of this walk requires no previous bushwalking experience, whilst the remaining 1km requires some bushwalking experience. 2km of this walk has limited facilities (such as not all cliffs fenced) and another 1km has limited facilities (such as cliffs not fenced, significant creeks not bridged). 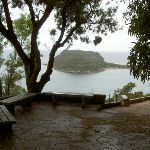 The remaining (480m) is close to useful facilities (such as fenced cliffs and seats). 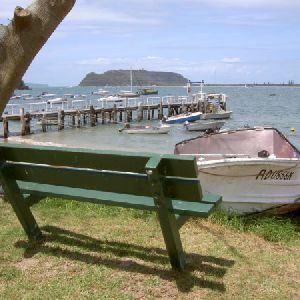 A list of walks that share part of the track with the Headland track (Resolute track) walk. 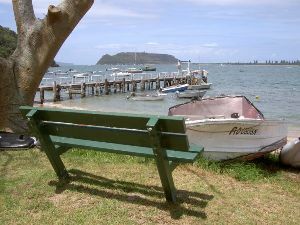 A list of walks that start near the Headland track (Resolute track) walk. 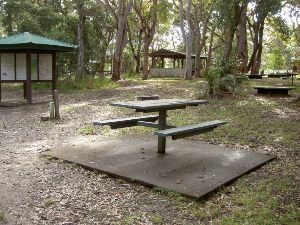 http://new.wildwalks.com/wildwalks_custom/includes/walk_fire_danger.php?walkid=nsw-krgcnp-whl Each park may have its own fire ban, this rating is only valid for today and is based on information from the RFS Please check the RFS Website for more information.